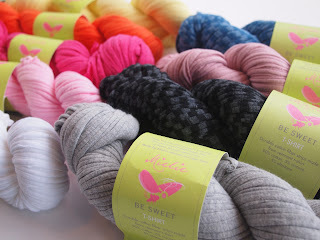 We have an awesome new yarn in from Be Sweet! Be Sweet is a woman-owned company that works to create employment opportunities for women in Cape Town, South Africa through handcrafts. Be Sweet T-shirt yarn is one of the amazing products they create and is made from recycled jersey fabric remnants from the t-shirt industry. Each shipment is totally unique as yarn is made in the colors and styles of the fabric being produced in local factories. Customers often ask what to make with t-shirt yarn. Lucky for you we have several great ideas. Bags are the first thing that comes to mind and each skein of Be Sweet T-shirt yarn comes with a pattern printed on the label for a "Honeycomb Camera Clutch." Tote bags would also be amazing and the stretch of the yarn means they could hold all sorts of things. 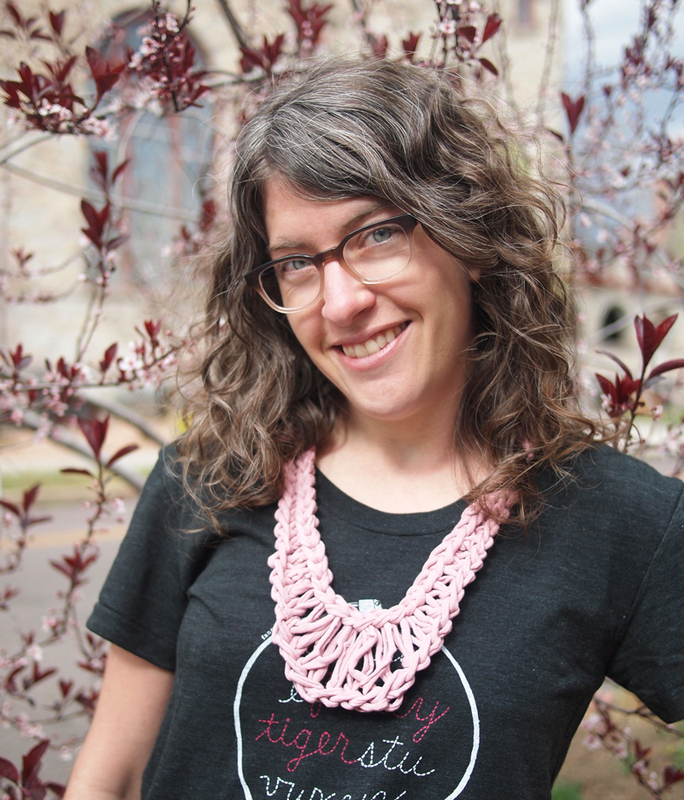 At TNNA, where we first saw and ordered the t-shirt yarn, I was inspired by a necklace one of the women had made from it. There wasn't a pattern for it so I've recreated it and written the pattern out for you. This knit necklace knits up in 20 minutes and you can make 2 - 3 from each skein. 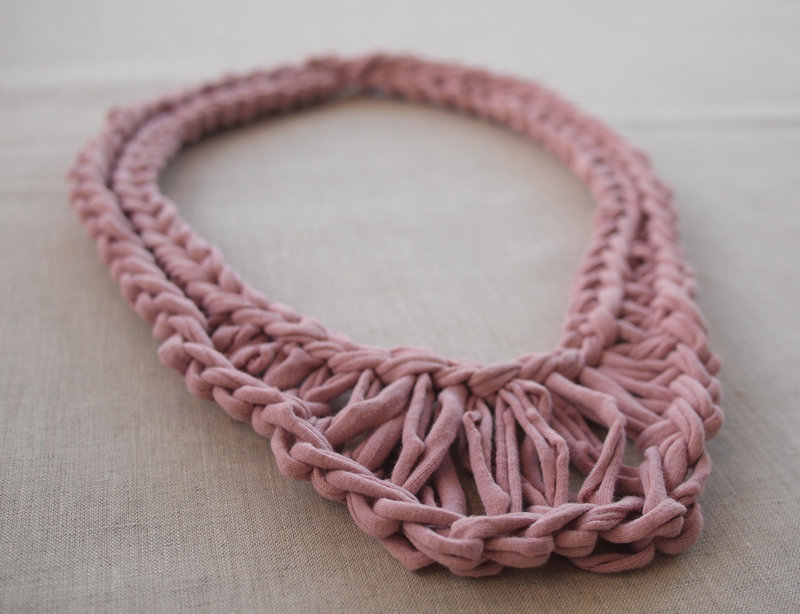 You can experiment with different numbers of cast-on stitches for a shorter or longer necklace. What a fast and fun summertime project! Cast on 60 stitches and join in the round. Knit 20 stitches. Knit the next 4 stitches wrapping twice for each stitch. Knit the next 3 stitches wrapping 3 times each stitch. Knit the next 6 stitches wrapping 4 times each stitch. Knit the next 3 stitches wrapping 3 times each stitch. Knit the next 4 stitches wrapping twice for each stitch. Knit the last 20 stitches normal, bringing you to the end of round 1. Next round, cast off! Cast off normal and just let the extra wraps fall off the needle as you go. When you get to the middle 12 stitches that have 3 or 4 wraps, you will want to knit 2 together for each cast off stitch, still letting the extra wraps fall off the needle. Continue casting off the rest of the stitches normal. Done! What a good idea! Thank you so much for sharing. Great necklace! I like it! the necklace is really amazing. I have an online Armine store in Turkey on woman accessories. If I could hire anyone who can hand craft such things in big scale, my customers would buy them. I LOVE it but i can't manage doing it! What do you do with extra wraps? I really don't understand how! I love it too and I'm spanish too so it's difficult for me understan al the instruction, have you got any video tutorial? How beautiful! I would love to include this project in a round up of tshirt yarn project ideas on my blog Sustain My Craft Habit, with a link back to your site for the instructions.